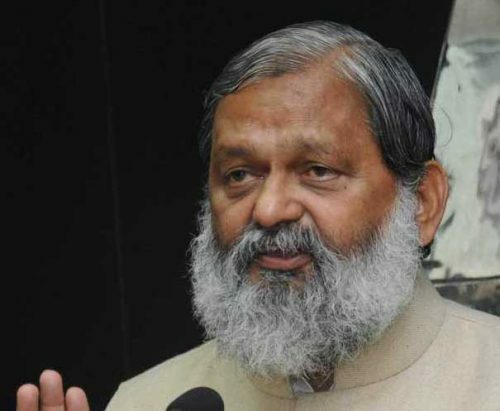 Chandigarh, May 5 : Haryana Health Minister Mr Anil Vij said that State government has decided to open Senior Citizen Corners in all Government hospitals in the state to ensure better services to them in these institutions. Mr Vij, who was addressing the media persons in Meet the Press programme organized at Chandigarh Press Club, here today, said that senior citizens need not stand in queues for their registration as staff would be deployed in these corners to properly guide and help them for any kind of treatment at these institutions. Describing health as a priority sector of the government, the Minster said that State government is trying to provide world class health care services to the people. A Memorandum of Understanding will be signed with a Central Government agency which would prepare a roadmap as per the prescribed international norms of health sector and submit the same to the government. Besides, government is utilizing technology as a tool to ensure all kind of services to improve the functioning of health department. The government has also made a provision of video conferencing for recording the evidence of doctors in civil hospitals. He said that the present government has increased the budget of health department from Rs 2897 crore to Rs 3916 crore for current financial year. With the consistent efforts, the number of patients in OPDs in hospitals has increased by 15 per cent. In addition, government has also decided to set up at least one MRI and CT Scan facility in all districts so as to ensure economical facilities in government hospitals. The same facility has already been installed in nine districts. The Government is also installing a dialysis machine under Public Private Partnership (PPP) mode in every district and work has already been allotted for 14 districts. Process for setting up of Cath Lab in four districts is being undertaken. Mr Vij said that Haryana government is introducing an online system of patients as per which online data of all patients visiting government hospitals would be prepared. It would be accessible in every hospital of the state. The Government is making a provision to give lab test report by SMS alert to patients. Government has also decided that 84 hospitals in the state would be given accreditation by the National Accreditation Board for Hospitals and Healthcare Providers (NABH). These hospitals included primary health centre, community health centre, sub-divisional hospital and district hospitals. With a view to meet the shortage of doctors, the Minister said that about 300 medical officers have been recruited by the present government. The Government is going to recruit more doctors in the state. In addition, a separate cadre of specialists is being made in the department so as to ensure all kind of heath care services to the patients. Highlighting the transfer policy of the department, the Minister said that a permanent transparent transfer policy would soon be rolled out for doctors and other staff of the department. A Software has been developed for the same. He said that government is actively considering to open atleast one medical college in every district in the state so as to match the number of doctors as per the guidelines of World Health Organisation. At present, eight medical colleges are functional in the state. The Government will open three government medical colleges in Panchkula, Jind and Bhiwani. In addition, Dera Sacha Sauda has also agreed to set up a medical college in the state. The SGPC is also setting up a Medical College in Shahbad as the present government has resolved all its issues. The SGPC has sanctioned Rs 104 crore for completion of building of this medical college in Shahabad, he added.